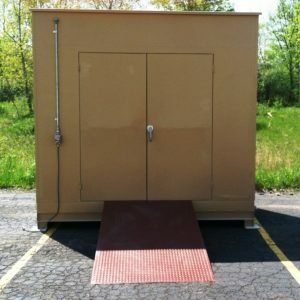 The ideal long-term 2-hour fire-rated outdoor storage solution for up to 12 55-Gallon Fuel Drums, along with other EPA mandated hazardous materials. Heavy-duty 12-gauge steel construction with an epoxy/polyurethane coat provides long-lasting durability against accidents and the elements. Heavy-duty steel grating allows for sturdy traction and spills to easily flow-through into the containment sump. Spills are captured in the containment sump allowing the user to drain, or remove the storage building grates and clean using Spill Containment Sorbents. The base is constructed with steel I-Beam Construction allowing for maximum support throughout the base of the Hazmat Storage Buildings. Anchors are welded into all four legs to allow users to permanently anchor (seismic restraints) if needed. Finally fork lift channels are welded into the side for easy relocation. 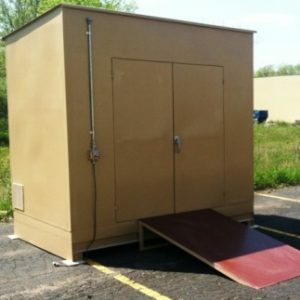 The ideal long-term outdoor storage solution for up to 12 55-Gallon Fuel Drums, along with other EPA mandated hazardous materials. Heavy-duty 12-gauge steel construction with an epoxy/polyurethane coat provides long-lasting durability against accidents and the elements. Heavy-duty steel grating allows for sturdy traction and spills to easily flow-through into the containment sump. Spills are captured in the containment sump allowing the user to drain, or remove the storage building grates and clean using Spill Containment Sorbents. The base is constructed with steel I-Beam Construction allowing for maximum support throughout the base of the Hazmat Storage Buildings. Anchors are welded into all four legs to allow users to permanently anchor (seismic restraints) if needed. Finally fork lift channels are welded into the side for easy relocation. The ideal long-term 2-hour fire-rated outdoor storage solution for up to 18 55-Gallon Fuel Drums, along with other EPA mandated hazardous materials. Heavy-duty 12-gauge steel construction with an epoxy/polyurethane coat provides long-lasting durability against accidents and the elements. Heavy-duty steel grating allows for sturdy traction and spills to easily flow-through into the containment sump. 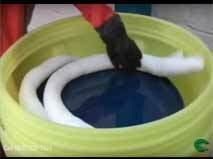 Spills are captured in the containment sump allowing the user to drain, or remove the storage building grates and clean using Spill Containment Sorbents. The base is constructed with steel I-Beam Construction allowing for maximum support throughout the base of the Hazmat Storage Buildings. Anchors are welded into all four legs to allow users to permanently anchor (seismic restraints) if needed. Finally fork lift channels are welded into the side for easy relocation. The ideal long-term outdoor storage solution for up to 18 55-Gallon Fuel Drums, along with other EPA mandated hazardous materials. Heavy-duty 12-gauge steel construction with an epoxy/polyurethane coat provides long-lasting durability against accidents and the elements. Heavy-duty steel grating allows for sturdy traction and spills to easily flow-through into the containment sump. Spills are captured in the containment sump allowing the user to drain, or remove the storage building grates and clean using Spill Containment Sorbents. The base is constructed with steel I-Beam Construction allowing for maximum support throughout the base of the Hazmat Storage Buildings. Anchors are welded into all four legs to allow users to permanently anchor (seismic restraints) if needed. Finally fork lift channels are welded into the side for easy relocation. 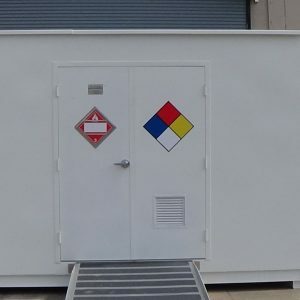 The ideal long-term 2-hour fire-rated outdoor storage solution for up to 24 55-Gallon Fuel Drums, along with other EPA mandated hazardous materials. Heavy-duty 12-gauge steel construction with an epoxy/polyurethane coat provides long-lasting durability against accidents and the elements. Heavy-duty steel grating allows for sturdy traction and spills to easily flow-through into the containment sump. Spills are captured in the containment sump allowing the user to drain, or remove the storage building grates and clean using Spill Containment Sorbents. The base is constructed with steel I-Beam Construction allowing for maximum support throughout the base of the Hazmat Storage Buildings. Anchors are welded into all four legs to allow users to permanently anchor (seismic restraints) if needed. Finally fork lift channels are welded into the side for easy relocation. The ideal long-term outdoor storage solution for up to 24 55-Gallon Fuel Drums, along with other EPA mandated hazardous materials. Heavy-duty 12-gauge steel construction with an epoxy/polyurethane coat provides long-lasting durability against accidents and the elements. Heavy-duty steel grating allows for sturdy traction and spills to easily flow-through into the containment sump. Spills are captured in the containment sump allowing the user to drain, or remove the storage building grates and clean using Spill Containment Sorbents. The base is constructed with steel I-Beam Construction allowing for maximum support throughout the base of the Hazmat Storage Buildings. Anchors are welded into all four legs to allow users to permanently anchor (seismic restraints) if needed. Finally fork lift channels are welded into the side for easy relocation. 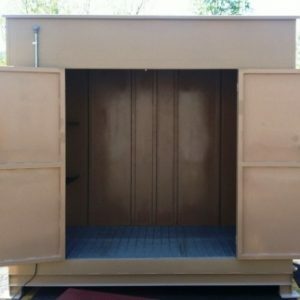 The ideal long-term 2-hour fire-rated outdoor storage solution for up to 36 55-Gallon Fuel Drums, along with other EPA mandated hazardous materials. Heavy-duty 12-gauge steel construction with an epoxy/polyurethane coat provides long-lasting durability against accidents and the elements. Heavy-duty steel grating allows for sturdy traction and spills to easily flow-through into the containment sump. Spills are captured in the containment sump allowing the user to drain, or remove the storage building grates and clean using Spill Containment Sorbents. The base is constructed with steel I-Beam Construction allowing for maximum support throughout the base of the Hazmat Storage Buildings. Anchors are welded into all four legs to allow users to permanently anchor (seismic restraints) if needed. Finally fork lift channels are welded into the side for easy relocation. The ideal long-term outdoor storage solution for up to 36 55-Gallon Fuel Drums, along with other EPA mandated hazardous materials. Heavy-duty 12-gauge steel construction with an epoxy/polyurethane coat provides long-lasting durability against accidents and the elements. Heavy-duty steel grating allows for sturdy traction and spills to easily flow-through into the containment sump. Spills are captured in the containment sump allowing the user to drain, or remove the storage building grates and clean using Spill Containment Sorbents. The base is constructed with steel I-Beam Construction allowing for maximum support throughout the base of the Hazmat Storage Buildings. Anchors are welded into all four legs to allow users to permanently anchor (seismic restraints) if needed. Finally fork lift channels are welded into the side for easy relocation.